The newest film from director Armin Nasseri, The Carting Call, premiered on the new platform BitMovio on Saturday April 13, 2019. The Carting Call is the newest film from Nasseri, who's last film, Seeking Valentina became the darling of film critics and film festivals alike. Seeking Valentia garnered over 30 awards, including several Best Film and an honorable mention at the prestigious Rondo Hatton Awards. 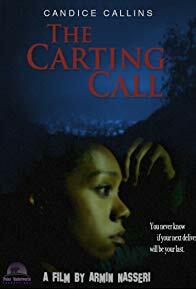 The Carting Call follows a food delivery driver played by Candice Callins (who also wrote and produced) on a horrible night. Even though she is warned by her best friend Audrey (Vanessa Esparanza), Callins' character Robin, is far more concerned about her financial situation than her personal safety,which turns out to be a horrible mistake. Given the current gig economy, and the proliferation of food delivery services, The Carting Call, is terrifying relatable. Callins she wanted Robin to be everywoman. "She finds herself in horrible situations, and she does what she needs to do, just to survive." The Carting Call also stars scream queens Sheri Davis and Kristin West along with funny man John Venable, in a terrifying role. Said director Nasseri, "I like to give actors the opportunity to play against type and out of their comfort zone." He added, "With a film like The Carting Call," I want the audience to be a little uncomfortable , too." While the film was premiering for the world on Bitmovio(www.bitmov.io), cast crew and supporters were treated to a special private screening at the Sepulveda Screening Room in Westwood. After the screening, guests were invited to a private star studded after party at Delphi Greek Restaurant, in Westwood. Delphi Greek Restaurant was chosen by producers, because it's not only one of their favorite haunts, but the restaurant was also used very prominently in the film. In the midst of the party atmosphere, Nasseri used the occasion to announce the development process has begun on his latest film, A Different Class. Nasseri's writing partner and co producer Dana Olita was also on hand to announce the project, which will begin filming sometime later this year,and will star 16 year old actress Rory Ogden. A Different Class is loosely based on Nasseri's own childhood experiences of being bullied and harassed by classmates, and discovering his own voice by using the American civil rights movement of the '60's and '70's and the rap music of the '90s to help him to find his own voice. Nasseri says "A Different Class is much different than any of my other projects, and much more personal. I hope audiences of all ethnicities will be able to connect with this film." The Carting Call is free to watch on the bitmov.io ap. To see The Carting Call, download the BitMovio app and search for The Carting Call.